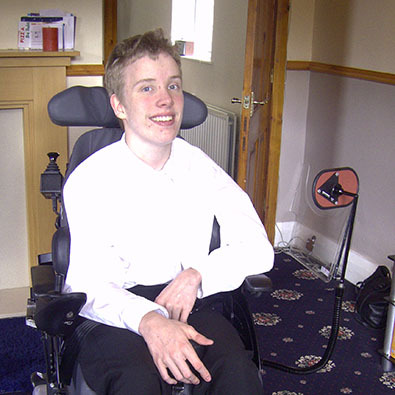 Seventeen year old John from Huddersfield has cerebral palsy. He had two problems with his wheelchair which we were asked to help with. Involuntary leg spasms caused the footplates to lift up, which could injure John, and when using the chair outdoors he couldn’t see people walking around him. We solved these problems by making special brackets to hold his feet in position, and by fitting a rear view mirror to the arm of the chair. John can now use the chair safely and is fully aware of his surroundings.